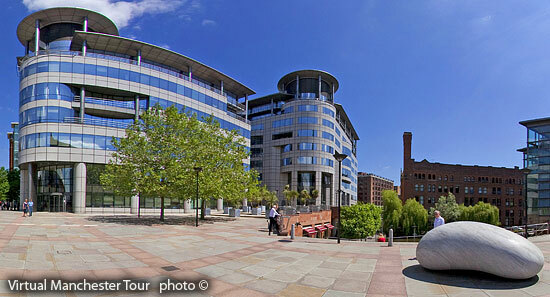 Manchester UK Guide & virtual tour of the City of Manchester UK. Piccadilly Gardens "The site was donated by the Lord of the Manor and had previously been called the Daub Holes: these pits had filled with water and they were replaced by a fine ornamental pond...."
Manchester Town Hall, Albert Square "The clock bell, Great Abel, is named after Heywood and weighs 8 tons 2.5 cwt. It is inscribed with the initials AH and the Tennyson line Ring out the false, ring in the true..."
Palace Theatre, Midland Hotel, Oxford Road Station Whitworth Street West, Station Approach "The Palace and its 'sister' theatre the Manchester Opera House on Quay Street are operated by the same parent company..."
Exchange Square, Shambles Square "The square is a major shopping area including a branch of Selfridges, the shopping centre the Triangle, a new entrance to the Manchester Arndale, including the world's largest Next store..."
What does Manchester mean to you? World class football teams? | World class universities? | The UK’s busiest airport outside London? | Amazing shopping? | A vibrant club scene and night life? | The world’s first industrial city? | Theatres? Music events? Shows? Concerts? | Chinatown? Cathedral? Squares and fountains? The truth is that Manchester has all these to offer and more and our tour takes you there from the comfort of your own home! Before you book your hotel or make that journey, you need to know where you should stay and what you can see or do – and of course, where to avoid! We are here to help you make those vital decisions, so that you can have the trip that's right for you! Join us on our virtual tour and read our personal, unbiased reviews, to check out the places of interest and sights to see. You can even view the whole city centre on Manchester’s own big wheel: The Wheel Of Manchester. Manchester Arndale is the UK's largest inner-city shopping centre, located in the heart of Manchester City Centre. The Arndale contains over 240 shops, including major department stores. Within a few minutes walk of the Arndale, there is Harvey Nichols store, Selfridges and The Printworks with its 19-screen Odeon cinema complex, over 15 bars, restaurants and clubs as well as the only I-MAX cinema in the North West. Manchester's Piccadilly Gardens was from 1755 the site of the Manchester Royal Infirmary though the street it stood on was then called Lever's Row: this continued south-east as Piccadilly. The site was donated by the Lord of the Manor and had previously been called the Daub Holes: these pits had filled with water and they were replaced by a fine ornamental pond. In 2001 - 2002 The gardens were renovated. At a contract cost of around £10 million Piccadilly Gardens renovation was shortlisted in 2003 for the Better Public Building Award. Content protected by copyscape © Unauthorised use of our copyright material is expressly forbidden.